When I first moved to L.A., I had the pleasure of dining at this lovely café on Sunset Blvd with my roommates. All three of us devoured a breakfast wrap that blew our 22 year-old-just-moved-to-L.A. minds, and we still talk about it to this day. The restaurant is no longer there, and I’m definitely not 22 anymore, but I continue to make a slightly, healthier version of the wrap and have no doubt it will be a hit with the kiddies. It’s decadent, quick and easy! 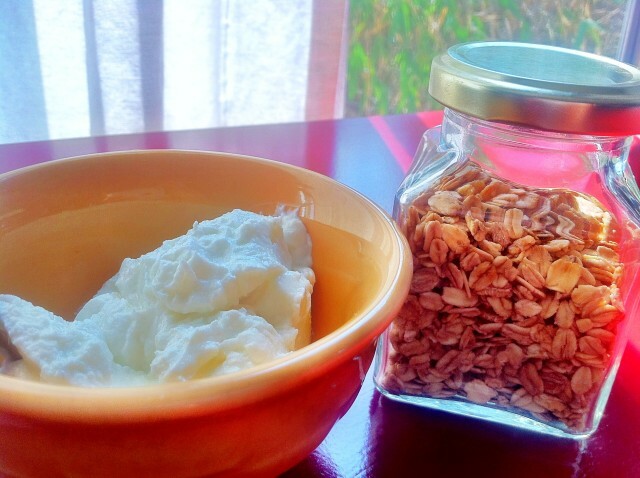 Mix together a large spoonful of yogurt, cinnamon and a drop of vanilla extract in a small bowl. So many vanilla yogurts are filled with sugar, so I do this instead, or sometimes I don’t even add the vanilla. Stir in ¼ cup of granola and chia seeds into yogurt and mix until everything is completely combined. If you are using the chia seeds wait a couple of minutes until they become gelatinous. Spread a thin OR thick layer of nut butter (depending on your mood) on the tortilla, and place sliced bananas on top of the nut butter covering most of the tortilla, except the edges. Drizzle a little honey over the banana if you desire a little extra sweetness. You can also add sliced bananas to the yogurt mixture if you prefer. I’ve done it both ways, and it works either way. Scoop yogurt and granola mixture onto one side of the tortilla and roll tightly. You can enjoy as is, or warm in the oven or microwave for 20-30 seconds. This can be breakfast, a snack or dessert! This recipe was featured on ModernMom.com–enjoy!